Scientists say Dreadnoughtus schrani was one of the largest dinosaurs to walk the earth. With a 11 metre (37-foot) neck and weighing in at 65 tonnes - the equivalent of seven Tyrannosaurus Rex - the 26 metre (85-foot) Dreadnoughtus schrani was one of the largest dinosaurs to walk the earth. It is the biggest land animal for which a body mass can be accurately calculated, say scientists. The findings, revealed in the journal Scientific Reports, are the result of years of work by a team of researchers from the US and Argentina. It took five years to excavate the remains of the massive animal, which were found in in southern Patagonia in Argentina, during trips made between 2005 and 2009. Researchers were able to make an accurate calculation of its size due to finding the most complete skeleton to date of a giant dinosaur, with more than 70 per cent of its bones represented. They included the femur (thigh) and humerus (upper arm), measurements of which are used to help calculate weight. 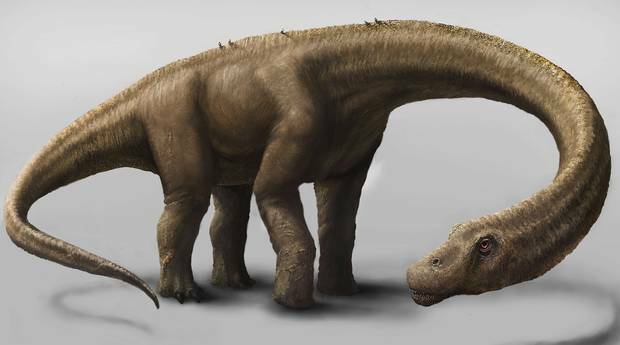 "Dreadnoughtus schrani was astoundingly huge," said Professor Kenneth Lacovara, Drexel University, Philadelphia, who discovered the skeleton and led the excavation and analysis. "It weighed as much as a dozen African elephants or more than seven T-rex. Shockingly, skeletal evidence shows that when this 65-ton specimen died, it was not yet full grown. It is by far the best example we have of any of the most giant creatures to ever walk the planet," he added. The new dinosaur belongs to a group of large plant-eaters known as titanosaurs. It lived 77 million years ago in a temperate forest at the southern tip of South America and was so enormous that it would have been unlikely to be threatened by even the likes of the T-rex, according to researchers. The humerus, right, and tibia bones from a Dreadnoughtus schrani "With a body the size of a house, the weight of a herd of elephants, and a weaponized tail, Dreadnoughtus would have feared nothing," commented Professor Lacovara. "That evokes to me a class of turn-of-the-last century battleships called the dreadnoughts, which were huge, thickly clad and virtually impervious." The dinosaur died after the ground on which it stood turned to quicksand in the wake of a flood, based on sedimentary deposits found at the site, researchers suggest. "The rapid and deep burial of the Dreadnoughtus type specimen accounts for its extraordinary completeness. Its misfortune was our luck," said Professor Lacovara. The bones were so large that they had to be digitally scanned to create a 3D model, and researchers are now studying scars left by muscles in an attempt to find out more about how the huge dinosaurs lived. Responding to the news of the discovery, Dr Paul Barrett, a dinosaur expert based at the Natural History Museum, London, said: "Dreadnoughtus gives us our first good look at the anatomy of these gigantic sauropod dinosaurs, which were previously known from rather incomplete material." He added: "This new information will help to shed new light on the relationships among these giants and the number of times true gigantism evolved."